This entry was posted in Blogs and tagged Euan Malpas-Vernon. WARNING: If your afraid of big scary latin names, turn back now. the following article is rated L for Latin. Hey Guys. I’m finally back and writing again. So who’s up for some fossil chit chat? Ever heard about Osteostracans? well your about to. It might sound like some kind of painful bone infection, but this group of fairly- obscure early fishes (they might be less obscure if those high and mighty PhD professors decided on a latin name that could be pronounced in lay terms :/) were long- lived and widely- distributed creatures. They were most common in the early Devonian, but they ranged in age from the early Silurian until the Late Devonian- which is when they perished in the devastating late devonian extinctions. Let’s explain the fish fauna of the Devonian with a quick thought experiment. Imagine going to a fish market (e.g at morrisons- they may have overpriced bread, but they have a great fish market) and taking a look at what’s in the cold ice. You see the usual selection of fish- Salmon fillets from Scotland, trout, snapper, herring, haddock, plaice, and (if your in China) Shark steaks. but imagine you could have a fish counter from the Early Devonian. What would you see? well, you might still see shark, but like no shark you’ve ever seen. smaller. more primive, and bonier- sharks of this age were less cartilaginous than modern sharks. However, the other fish you might see bear absolutely no resemblance to the fish counter of today. There are the Crossopterygians (yes, sorry people, the dreaded scientific latin is in full force today), the major group of lobe- finned fish that the living ‘fossil’ Coelacanth belongs to, as well as the four living species of Lungfishes, and…guess what? YOU! yes, the Tetrapods form part of this group too. So, if you boil it down, you, me, (definately my sisters) and every other person on the planet IS NOTHING BUT A FISH WITH LEGS! we can thank those hard- working fish that came ashore during the devonian for that little fact. Anyway, wandering of todays topic. Back to our Devonian fish store…. There were the Thelodonts. A bizarre group of small fish without jaws and with no pectoral or pelvic fins. Then there’s the Placoderms (meaning plated skin), fish covered in thick scales and particularly- thick trunk armour.You might see the Heterostracans, another group of fish without jaws and often equipped with thick armour. In fact, most of the fish for sale on this fish counter have no jaws. And this is true of the Osteostracan fish as well. Today, we’ve come to the fish store looking for an Osteostracan out of all the devonian weirdos. So we buy one. Good, this way we get a good look at one. And it’s definately weird. They had a long, flexible torso and body protected by overlapping scales and plates. At the front, this is exchanged for an impressive headsheild which covers the entire head and neck, terminating in large spines (called Cornua’s) that are characteristic for each species (The shape of the headsheild also varies between species). One each side of the creatures headsheild are areas of super-sensitivity. These organs are thought to have been used to detect movements, possibly for detecting prey on the ocean floor (as they are thought to have been fairly slow swimmers who fed on small bottom- dwelling organisms). And the more advanced species in the group also developed paired fins behind the headsheild. Most likely not for use in swimming, but perhaps for steering. Fish with jaws evolved, not so surprisingly, from fish without them. Simple enough, except that all earlier fishes had no jaws. Scientists have spent the last 50 years picking apart the complicated lines of evolutionary descent of these early fish, and we now have a pretty good idea of what was going on (but like I said, 1 find can change everything, so I’ll say no more). The Osteostracans, according to these studies, is the sister group to the fish with jaws. Basically, they were the most closely related to the jawed fish than any of the other weird devonian jawless types- so they were the most advanced of the fish without jaws of this time. But why have I just ranted about Osteostracans, a group you may (or may not) have ever heard of, out of the blue? Well, there is logic. A few years ago, I managed to drag my parents halfway down the country for the sake of fossils yet again (hey, it was the day before my birthday, so I got away with it). We went down to the Wren’s Nest Nature reserve in Dudley, and wasted the best part of an hour of nice july weather trying to find the site- which we did, after we realised that the reason we couldn’t find it was because it was hiding dead centre in the middle of crappiest housing estate I’ve ever seen (so far; apologies to anyone from Dudley reading this- nothing personal. And anyway, who cares? You’ve got world- class fossils. Much better than anything I’ve got here in Manchester). Where’s this going? Well, we got into the Nature reserve, had a spot of lunch, and fanned-out heads to the ground in usual fossil- hunter fashion. After a few minutes, I spotted something shiny embedded in a badly- weathered chunk of limestone. I grabbed it, and inspected the weird pits and bumps on the surface of whatever it was. At the time, I didn’t have a clue. But since then, I’ve spent more time looking and cleaning the specimen up, and I can say that in my opinion, it is an Osteostracan. But I’m also consulting a few experts on these animals because it could be more than this. I have corresponded with Dean Lomax- who you probably know about, either from his damn good books, or in person if you were there on the Doncaster plant hunt earlier this year (or was it last- my memory is shoking). He believes the specimen is worth taking to an expert on fossil fish. If the specimen really is an Osteostracan, then not only would it be the first of its kind found at this location, but it may be a new species. But it’s too early to tell, so there will be no big claims. I only ask that if anyone knows any other scientists who might like a look at it, then could you message me how to contact them. KEEP FOSSIL HUNTING – AND GO FIND A NEW SPECIES. THE FOSSIL RECORD IS SO POROUS THAT ONLY 1% OF THE CREATURES THAT HAVE EVER EXISTED HAVE BEEN FOUND AND NAMED. JUST THINK OF THE WEIRD CRITTERS OUT THERE TO FIND. God, I haven’t posted a single entry since august at least. I have all these images to post, but none of them have yet made their way on here- been so busy with one thing and another (College mostly). I was planning to start writing articles again by the start of December at latest, but then got tied down by exams and Christmas shopping ( I must be broke by now). In Any case, I’ve got some articles in the works at the moment, but I would like to ask UKAFH members for ideas on subject material; essentially, what do you guys want to know about fossils. Also, I would be happy to answer any questions or hear any ideas you may have read about- as well as what you have found. Recently, I went on the Carboniferous hunt at Buxton (came back with a rather badly- damaged Stromatolite, two nicely preserved coiled Gastropods, and GAZILLIONS of Productid Brachiopods, but anyway, moving on), but could not make it to any of the other recent hunts. Would anybody who has been on the other within the last month or two mind telling me about how it all went? I shall try to post some images shortly, but they will only show up as a link on the blog- for some reason, that’s all it can manage (I’ll make a mental note to ask Craig about it soon). However, if you click on them, it should take you straight to the images anyway. Hey all. Sorry that I haven’t done much with the blog for just over two weeks now. Was away searching for Cretaceous Ammonites and Belemnites in the French Alps. The site itself, as far as I know, isn’t known at all outside of France, and even the French themselves don’t usually go there for the fossils either. It isn’t, at first glance, the most abundant of fossil sites, partly because the number of outcrops there is limited, and partly due to the heavy degrees of pressure that the rocks were exposed to during the uplift of the Alps region in the Tertiary. However, if you take the time, say a few hours, to look and prospect, you turn up a few nifty pieces. I won’t reveal particular details of the site or its name just yet, as I intend to write a full article on these French fossil cephalopods which will appear around the end of this year. For anyone who might like to hear about it sooner than this, I am sorry. It’s taking time to process all the finds, photograph them individually, give them dates and names, add them to a database, and identify them to genus and/ or species level. Also, I cannot go back to the location until December at the earliest, as that’s when I’m booked to go back. Anyway, I’ll be trying to swell UKAFH members with at least a few articles before then. – I’m planning to write one on Northern Ireland sometime in the next few weeks. Sorry. Would have discussed the hunt earlier, but I’ve been busy with one thing and another since we got back. Anyway, both days went great, and the Gilwern Hill locality was teeming with Trilo’s! Honestly, I challange anyone to go and NOT find some. The most common species is Ogyginus corndensis, and they can be found in all sizes- from absolute tidlers to occasional monsters several centimetres long. Thanks should go to Pete Lawrance for showing me the tricks to Trilobite hunting. I’ve just bought his new book, “Trilobites of the World” (also by Sinclair Stammers). The book shows that there were many other species of Trilo’s to be found at Gilwern Hill, such as Ogygiocarella, Primaspis, Anebolithus simplicior, Meadowtownella (really wish I could’ve found one of those- they look very cool, especially with the fringe of spines), the Asaphids, Bettonolithus chamberlaini and Trinucleus abruptus, and Protolloydolithus. I won’t be able to blog for a few days after this Friday as I’m going up to Conwy, North Wales, and won’t have internet access. I’ve checked my Geological maps of Southern England and Wales, and apparently, many of the rocks in the Conwy area are Lower Ordovician. There are also Visean- aged Carboniferous Limestones. Does anyone know if Trilobites (even if rare) can be found in the Conwy area? As for Sunday’s Yaxley and Kings Dyke hunts, well Craig (naturally, as he’s lucky) hit the jackpot (testimony to how jammy he is) and found a slightly- distorted (due to compression of the Oxford Clay on top of it) HUGE Ichthyosaur vertebra- complete with the processes on the top. After that, there was a mad buzz for 20 minutes while everyone began frantically excavating, hoping there’d be more of the beast to be found. No such luck. I’m telling you, its a good thing he whisked it away sharpish as half of us were plotting on ambushing him when we reached the cars later on (all in good humour of course). Beside the Ichthy bone, there were literally thousands of Genicularia worms, some belemnite fragments (mainly Cylindroteuthis), bits of driftwood, and also the occasional ammonite whorl fragment found at Yaxley. me, and several other members got completely lost on the way to the Kings Dyke nature reserve, and ended up in the working brick factory and workers car park instead (at least there were toilets). Still, everyone got there sooner or later. We didn’t have much time for fossil hunting though, because the heavans opened, and (to be blunt) we got piss wet through and chilled to the marrow. The hunt was cut short. At least there’s always next time. The pit at Kings Dyke contains lots of spoil dumps- but mounds of clay which the diggers have piled up while excavating. Looking thoroughly (I hope you like getting muddy, because the best way to look closely is on hands and knees) you’ll find all kinds of interesting bits and bobs in the spoil heaps, such as fish scales, sharks teeth (there are over 15 different sharks recorded from the Oxford clay), bivalves, Ammonite fragments, bits of belemnite guards, and the occasional bone fragment. These will probably have come from a skeleton that was once present, but was distubed during the diggers’ excavating, and bits of the skeleton may have ended up on the spoil heap. Conversely, they may have been preserved as just isolated fragments- perhaps the animal they came from was preyed on and dismembered by predators in the water column, and as they fed, the easily removed bits like the limbs and flippers, sank to the seabed where they were preserved. On the pit floor, you’ll see large greyish concretions. Take the time to walk about, and check a few out. They often contain intact fishes and large marine reptile bones. You’ll need a geological hammer, though, as they can be tough to crack. When bone fragments from Oxford clay are exposed to the elements for a short time (be it a few days or weeks) they gain a sort- of, yellowish tinge. Peterborough is one of the most important Late Jurassic (Callovian to Oxfordian) marine sites in the world, and has provided some of the most complete and well- preserved marine reptile skeletons ever discovered. Even today, new discoveries are beng made in it, for example, not more than a few years ago, a completely- new genus of Pliosaur was discovered in Kings Dyke. It was named Pachycostasaurus dawni, and was unusual for the high degree of bone ossification in its skeleton, mostly towards the animals front end. The discovery has surprised Palaeontologists, as they didn’t expect a new genus to be found in the Oxford Clay- after all, its the best studied Late Jurassic community. It was suggested that Pachycostasaurus was perhaps a benthic feeder, hunting for bottom- dwelling decapods (crustaceans, like shrimps and lobsters) and molluscs. So, on the upcoming visit to Kings Dyke next Saturday, look out for any remains of this animal. For anyone who wants additional information on this animal, search for “A pliosaur (Reptillia, Sauropterygia) exhibiting pachyostosis from the Middle Jurassic of England”published in the journal of the Geological Society. If you do not have access to the journal, try and search for it as a Pdf. There are also a large number of Metriorynchid Crocodiliformes, including Dakosaurus maximus, Metriorynchus superciliosum, and the newly named Tyrannoneustes. I have not included an exact list for the Metriorynchid and Geosaurid crocodiles because there is currently scientific debate over which specimens should be considered valid species, and exactly how many crocodillian species there were present in the Oxford clay. So, with so many marine reptiles around, you have a pretty good chance of finding a few bone fragments. Above, are a few tips to help point you in the right direction. be posting some (hopefully) useful tips to finding some impressive specimens very soon. However, today, let’s just start with a summary about fossils- and what incredible things they are. Fossils have fascinated human beings for millenia, and because people could not originally explain their existence, what they were, how they were made, or where they came from, they invented many myths and a lot of folklore and heresay to explain them; Belemnites (the rostra of squid- like animals) were thought to be darts from heaven, flung down by gods during lightning storms, and Ammonite shells were believed to be snakes turned to stone by St Hilda (which is why one ammonite is named Hildoceras). Chalk Echinoderms were thought to be cakes made by Fairies or Sprites.They were thought to have medicinal powers. Belemnites, for example, were thought to be able to treat Rheumatism, sore eyes, and as a cure for a Horse’s intestine stones. Also, in an age when the church held sway, many fossil animals were thought of as having been killed in Noah’s Biblical flood. So, its clear, that fossils have intrigued us for a very long time. Today, fossils are at the fore- front of modern science, for by looking at the past, we can predict future events, such as climate change. 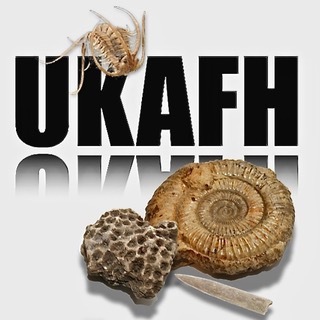 UKAFH itself could easily become a very valuable scientific resource, particularly because of our members’ enthusiasm, and also because the major fossil discoveries are mostly found by people like our members, and like you, and not bey scientists. For example, Charnia, a mysterious Pre- Cambrian organism, was discovered in Charnwood forest by schoolboy Roger Mason, and the ‘horned Scelidosaur’ of Charmouth, and armoured early Thyreophoran dinosaur was discovered by an accomplished amateur collector called David sole. You rarely forget that feeling you get when you find your very first fossil. The knowledge that nobody else has ever laid eyes on that fossil before you is exhilarating. Even if it something as seemingly ‘dull’ as a small fossil shell, the mere fact that what you have found could be over 300 million years old, is pretty mind- blowing. Just stop and step back to think about that for a second. There are 24 hours in a day, and 365 days per year, and 3650 days in a decade. But just imagine how many days are in a million years- probably in the hundreds of thousands. Then imagine timesing that enormous number by 300- Its an almost inconcievable amount of time, even for people used to dealing with geologic time. Also, although your fossil is lithified (turned to stone), it was once a living, breathing, thinking, creature – much like you. But, do you know what I think is the most amazing thing about fossils and fossil hunting? besides its being fun, Its that you never know what you might find, or what’s out there just wanting to be found. You could find a cool new prehistoric critter all of your own- and perhaps it will be named after you. That’s immortality of a sort. That kind of animal will always bear your name, and you will be remembered by science. So, keep on fossil hunting members cos you don’t know whats in the next rock you turn over.